The People Management Association of the Philippines (PMAP), the preeminent organization of people managers and human resources (HR) practitioners in the Philippines, will hold the 2nd HR Innovation Summit on August 15, 2018 from 9:00 am to 5:00 pm. It will take place at Crowne Plaza Manila Galleria at the Ortigas Center in Quezon City, Metro Manila. The theme of the 2nd HR Innovation Summit is “HR Next Practices.” This momentous event will feature industry experts and distinguished practitioners to share their knowledge and innovative ideas that will equip organizations in developing employees to thrive in the opportunities and challenges today and in the future. The line-up of remarkable speakers includes PMAP President Michelle C. Garcia, FPM,who will talk about “Revolutionary HR: The Next HR Leadership.” She is also the HR Director of East-Asia Region SGS Gulf Limited (Regional Operating Headquarters). Aside from the exciting talks, participants will also have the opportunity to be introduced to new products and services from various companies through their exhibit booths at the HR Techxhibit Hall. PMAP also welcomes partnerships for this event. 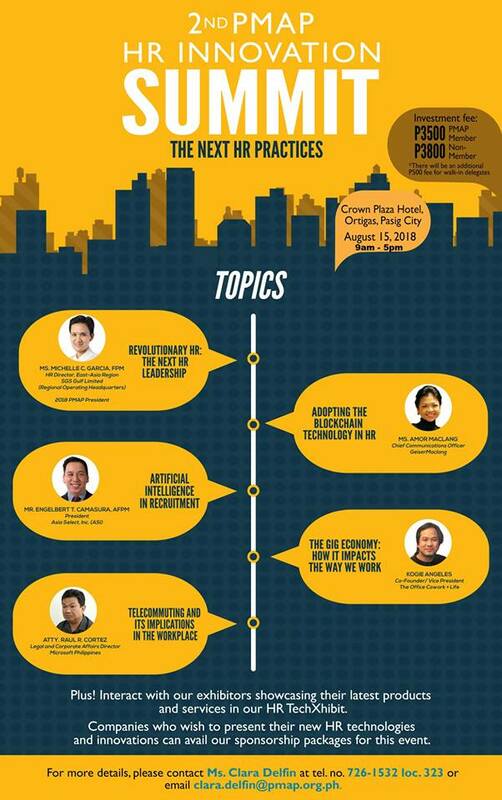 The summit is open to the public and guarantees an interesting and relevant day of learning about HR best practices and innovation to be attended by HRM and business professionals, representatives from the academe, SMEs and industry partners. The investment fee per delegate is 3,500 pesos for PMAP members and 3,800 pesos for non-members. For more information, please contact Ms. Clara Delfin at tel. no. 726-1532 loc. 323 or email clara.delfin@pmap.org.ph.